As football season grows ever closer, it is a good time to begin thinking about using our wide selection of promotional footballs for your events' needs. We are eager to work with you to promote your business or special event through a custom football. One of the most familiar events associated with start of school in the fall is the beginning of football season. It is the time of the year when students, faculty and the community come together with pride and enjoyment. Imagine what an added impact it will offer to provide the school body and the community mini plastic, vinyl or foam footballs in the school colors with the school logo printed on them. Our awesome and wide variety of footballs can be used as part of a pep rally or a team fundraiser. Raise School Spirit with Custom Footballs. Cheerleaders can engage the crowd and get them riled up by periodically tossing out our footballs - which are both soft and safe! They are great souvenirs for spectators to take home, as they small and safe for all ages. Choose the foam or vinyl mini footballs for throwing out at crowds, as the plastic are hard and can cause injury. If you are a business, why not sponsor a local school or college by helping them order printed footballs that can be sold to raise money for the football team? However, mini footballs aren’t only for schools. Businesses can also have mini footballs made, with the business logo, to give out during fall conferences that coincide with the football season. A great morale booster! Use custom designed mini footballs for promotional purposes as you might use a coupon for a product or service. How about adding decorative stripes on the ends of the plastic or vinyl mini foot balls for a special look? Since the smaller footballs are already quite low in price, adding a decorative feature such as solid stripes, star stripes, paw print stripes and more, is only adding a few cents more to the cost. The overall effect is a promotional product that really stands out among the crowd for the lowest prices around. 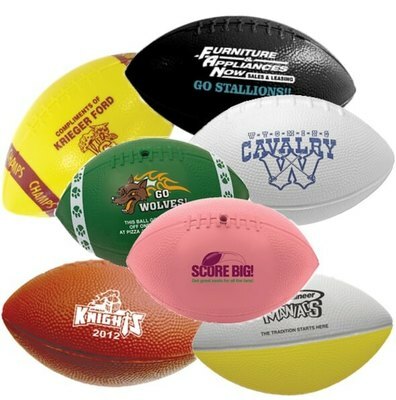 Explore our selection of custom footballs or contact us today to discuss your promotional needs. Whether from a booster club, sports team, or a business, we are available to guide you though the process and get you the product that will make your special event really stand out.